With these words Captain Nichols showed his relief at finally sighting the lighthouse signal he had been looking for. His entry into Bass Strait had been worrying. The weather was thick and dirty, with no observations possible. Communication with the Mary Blair on the previous day had given him cause to doubt his compasses. He had been up on deck day and night for the past 48 hours, taking every possible precaution in the treacherous waters. His relief was short lived, however. He had mistaken the Cape Wickham light for Cape Otway’s, and his altered course took the Blencathra straight onto the coast. “The next thing I heard was somebody singing out, ‘All hands on deck – save ship’ “ WILLIAM FISHER, Second Mate aboard the Blencathra. 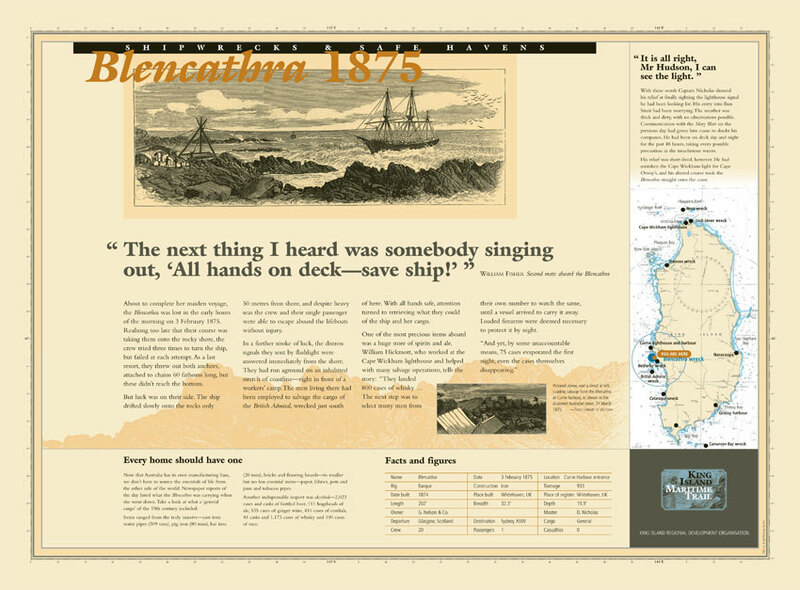 The barque Blencathra sailed from Glasgow for Sydney on her maiden voyage on 26 October 1874 with general cargo, one passenger, and a crew of 19 under Captain D Nicholas. In “speaking” to another vessel on 2 February 1875, it was found there was considerable variation in the Blencathra’s compass, probably due to the iron hull, but it was not adequately compensated for. Expecting to sight Cape Otway light, during the evening of 3 February Cape Wickham was sighted but mistaken for Otway. The ship’s course was altered to south-west, and two hours later the inevitable happened: breakers were seen dead ahead. As a consequence of the heavy swell and the vessel being under reduced canvas, she was unable to go about, and both the port and starboard anchors were dropped. The cables, however, soon parted, and the Blencathra drifted ashore directly under the bank where the Currie lighthouse was later built. All hands landed safely with the assistance of the party that had been handling the British Admiral salvage operations, and later the two groups co-operated to begin the recovery of the vessel’s cargo, much of which was unloaded quite undamaged. The next vessel involved with the British Admiral salvage, the ketch Secret, then picked up the Blencathra’s complement and landed them at Melbourne. The wreck of the Blencathra was sold to L. Stephenson & Son of Melbourne, who promptly sent the steamer Rescue to the site with a salvage team and Customs officials, the latter being most concerned with the large quantity of dutiable goods on board. After 25 tons of gunpowder was unloaded, 800 cases of whisky were unloaded and stored on a section of flat rock under guard for the night. Even so, by daylight 75 cases had vanished. It does not appear to have been recovered, but the ketch Kangaroo was later seized when a large quantity of tobacco and other goods stolen from the wreck were found on board. She was condemned by Customs, send to Launceston and sold at auction. Efforts to refloat the Blencathra failed, and she broke up in gale on 15 August. By this time most of her cargo had been recovered. A lengthy court case over the right of the master to sell the cargo was eventually settled more or less to the satisfaction of all on board. An inquiry into the wreck exonerated the master and his officers for the loss of the vessel. It found that once the master had mistaken Cape Wickham light for Cape Otway and become trapped by the strong sought-westerly current, there was nothing the crew could have done to prevent her from going ashore. Blencathra, O.N. 69,716 was an iron barque of 933/899 grt/net, 202.0 x 32.3 x 19.9ft., built at Whitehaven, U.K. by the Whitehaven Shipbuilding Co., in 1874 and was registered at Whitehaven in the name of G. Neilson & Co.